The latest challenge event in Pokemon Go will temporarily unlock Farfetch'd worldwide, assuming players can catch enough creatures. As Americans are preparing for tomorrow's inevitable food comas, Niantic is keeping a watchful eye on Pokemon Go's overall creature capture rate. The development team recently kicked off the new Pokemon Go Global Catch Challenge, and if players can manage to capture enough creatures by this Sunday, the studio will disperse the Flying-type Pokemon Farfetch'd out into the wild. This won't exactly be a small task: the number of captured creatures required to unlock Farfetch'd is set at 3 billion. Billion. Fortunately, good progress has already been made: as of yesterday, just over one billion creatures had already been captured. Considering that progress was made since early Monday morning, players definitely still have a chance to pull in big numbers. 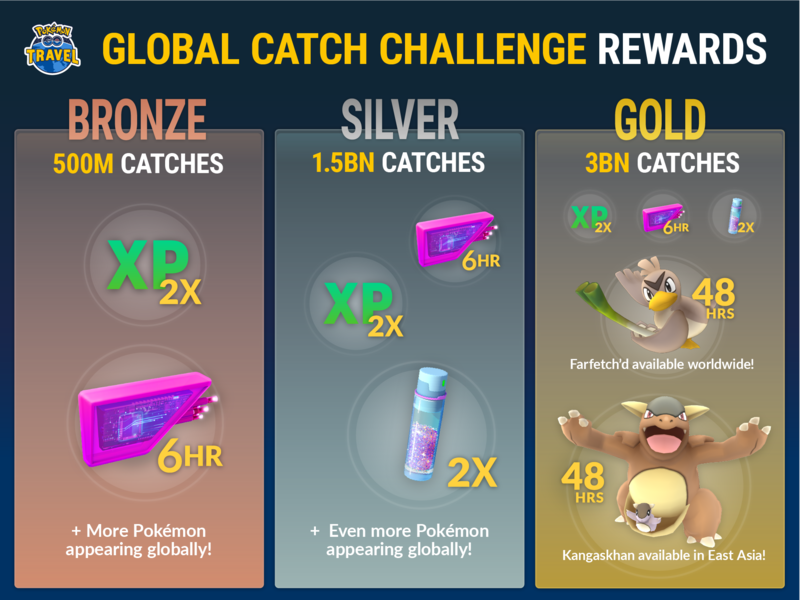 And, in the totally-plausible case players don't quite reach 3 billion captured creatures, Niantic is still willing to provide other bonuses: 500 million overall catches — a goal that has already been met — will unlock a temporary double XP bonus and six-hour Lures, while 1.5 billion captures will unlock both of the previous bonuses as well as double Stardust. Assuming players can work together and capture 3 billion creatures by the Sunday deadline, Farfetch'd will be made available worldwide for just 48 hours, with Kangaskhan being unlocked in East Asia for the same time period. It's not immediately clear whether or not East Asian territories will also be getting Farfetch'd in addition to Kangaskhan, but either way, it's likely that Pokemon Go players will still have their hands full trying to capture the rare creature before it disappears. Did you accidentally use "millions" a few times there? "And, in the totally-plausible case players don't quite reach 3 billion captured creatres, Niantic is still willing to provide other bonuses: 500 million overall catches — a goal that has already been met — will unlock a temporary double XP bonus and six-hour Lures, while 1.5 million captures will unlock both of the previous bonuses as well as double Stardust. Assuming players can work together and capture 3 million creatures by the Sunday deadline, Farfetch'd will be made available worldwide for just 48 hours, with Kangaskhan being unlocked in East Asia for the same time period." I sure did. Good eye, chief, those later two instances should say billion. Thought so -- just wanted to confirm there wasn't some other metric that was being referenced. This is Niantic trying to get their "moment" showing a linkage between their AR games can coincide with large scale events with huge reactions. They tried to pull this off at pokemon go fest, but got egg on their face due to the massive fuckups on multiple levels. (I was there, there were at least 20 professional cameras videoing everything all day, none of that content ever came to light). I believe it was to culminate at the end of the day when the challenges were met and legendaries were sprung loose. The crowd was supposed to go wild, on film, and Niantic could use this to bolster their image as an AR platform. As pitiful as Pogo has been after the last year and a half, they managed to snag Harry Potter as their first customer for their platform, which crashes *every single time* they release literally anything new. Spoofing and bots run rampant, still, and they're on record in having in excess of a billion in revenue back in February. I am a *very* salty, jaded, pissed off level 40 player. I have spent a decent amount of money, time and effort trying to keep this game "alive". I posted a long post on reddit /r/pokemongo going into even more detail with my grievances with Niantic. It instantly went to the top of the subreddit, and I received reddit gold, then it was nuked by their moderation team. The next day the posted a new policy on negative posts. Don't get me started on Trainer Tips not getting invited to "Pokemon Travel". You either shill for Niantic and bend the knee, or you're out, regardless if you have legitimate concerns or not. Man I hate those guys. This is what I posted to reddit before it was taken down. I stand by my statements. That's curious — did the moderation team give you a reason why they removed your post? Granted I know that reddit clearly has the right to remove anything they choose, but silencing criticism of a video game still seems pretty out of touch.